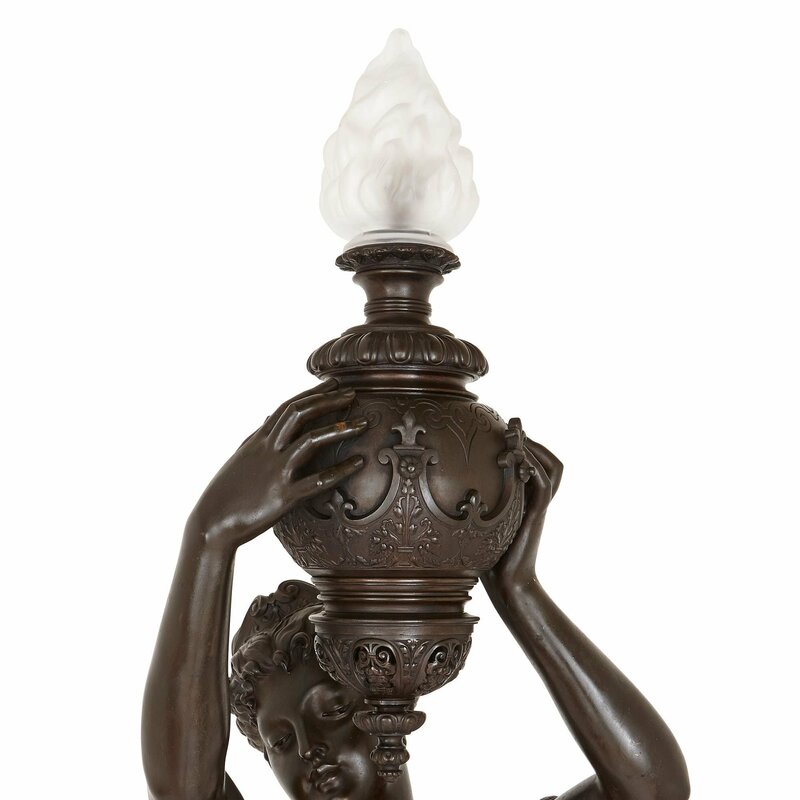 Produced in France in the 19th Century, this piece is both aesthetic and functional, serving as an exceptional piece of bronze sculpture and as a lamp. 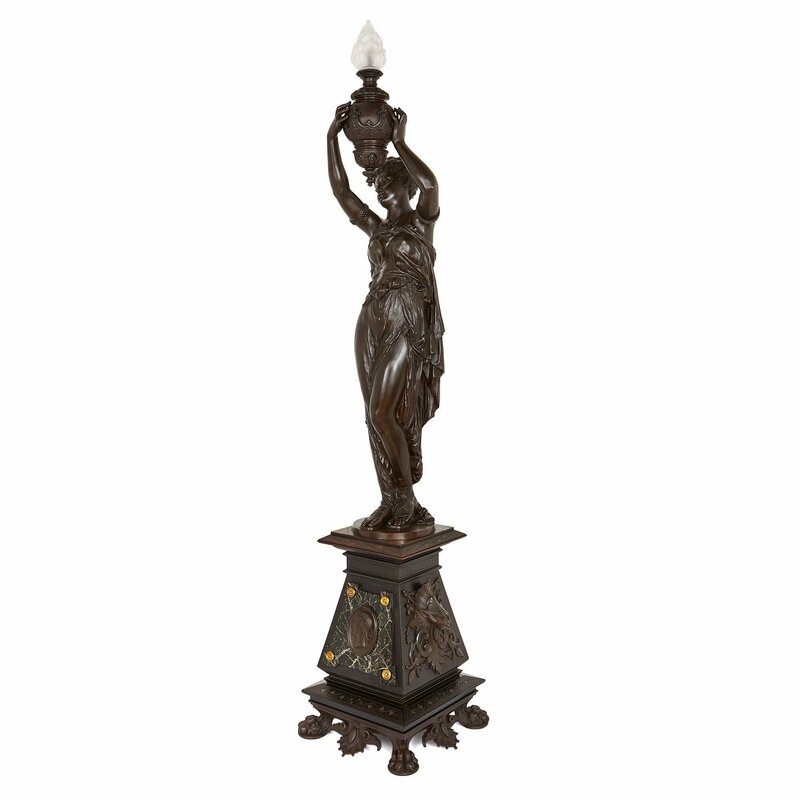 This bronze floor-standing lamp, or torchère, takes the form of a young woman, who stands on a tall plinth and holds aloft a flaming urn. 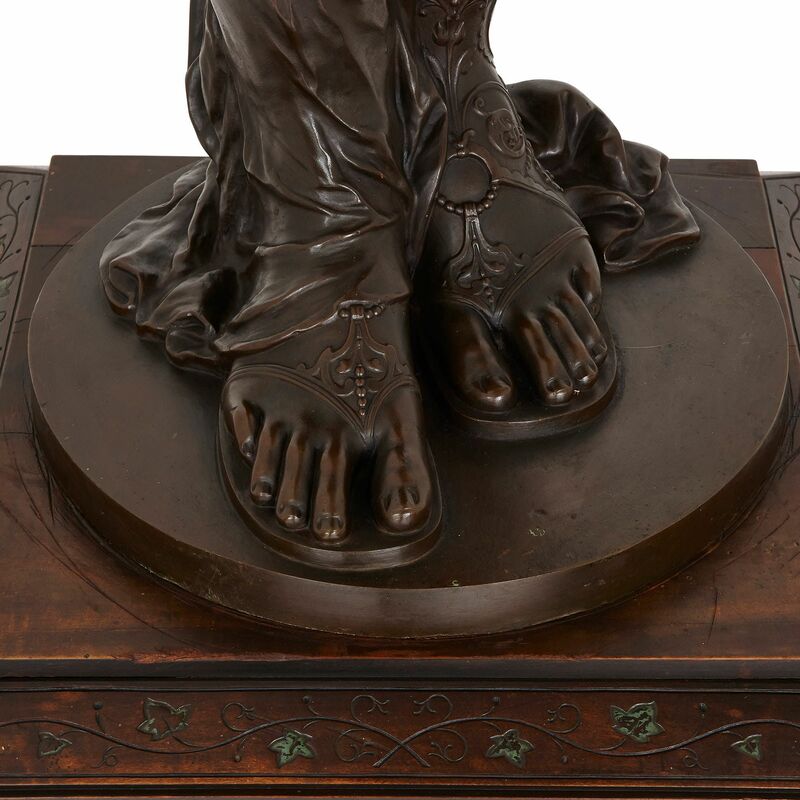 The plinth that the figure stands on is crafted from ebonised wood, and is decorated with patinated bronze and marble mounts, and raised off the ground by four bronze paw feet. 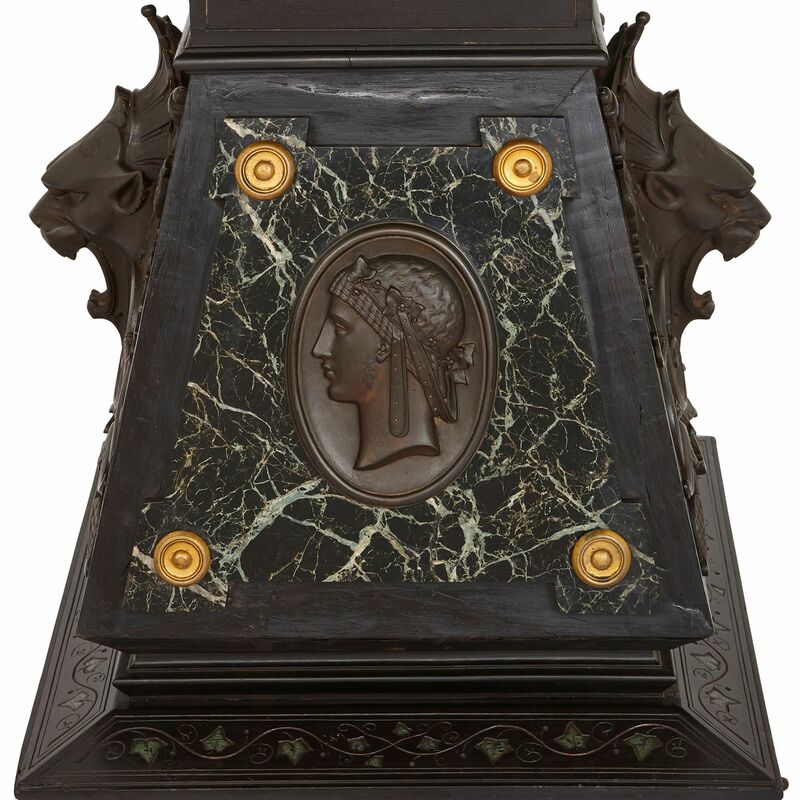 The front and back panels feature black white-veined marble veneers, which have circular ormolu forms in each of their corners, and a bronze classical profile of a young man at their centre. The sides of the base are mounted with stylised lion's heads, set against crossed sceptres and scrolling forms. Surmounting the plinth is the figure of a woman, who adopts a classical contrapposto pose. She rests her weight on her right leg, allowing her left to bend at the knee. This weight shift causes the woman’s hips to tilt slightly, accentuating the beautiful curve of her body. The woman wears a diaphanous dress, which clings to her legs, stomach and breasts. Her head is turned to the side, and she lowers her eyes to the ground. 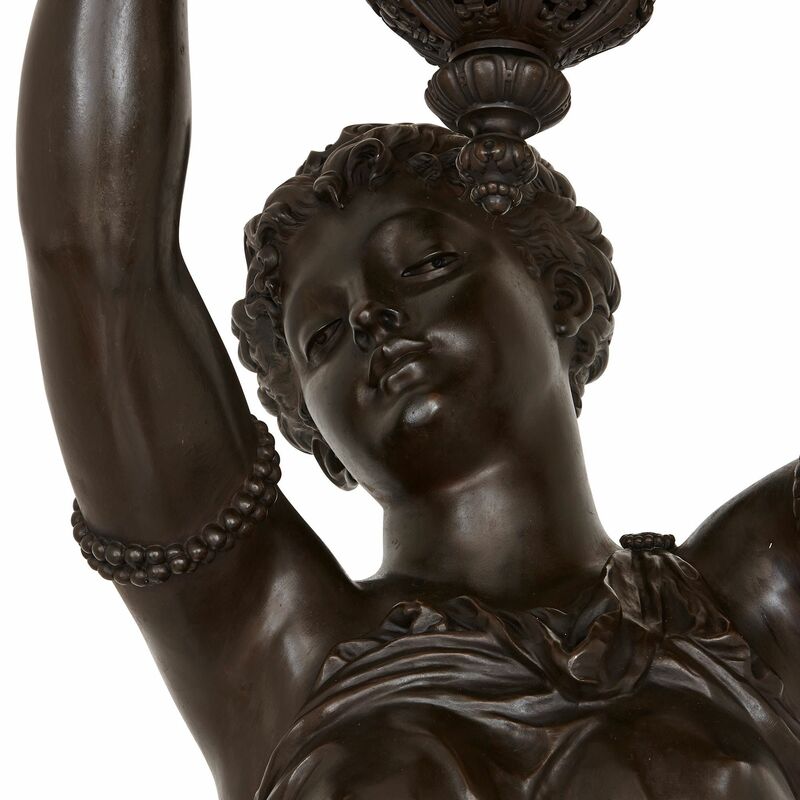 Above the woman, held in her outstretched hands, is a classical urn. The urn has a large decorative lower finial and a ball-shaped body, decorated with foliate patterns and trefoil profiles. The neck features an egg and dart moulding, and the flaming top is crafted from glass, forming the lamp. 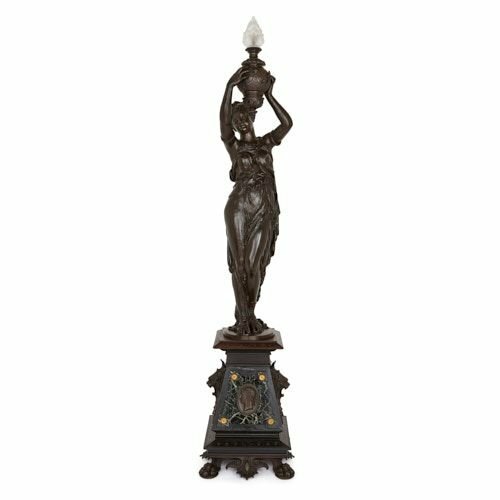 Once turned on, this light produced by the lamp will reflect off the polished bronze, further highlighting the beautiful form of the woman.